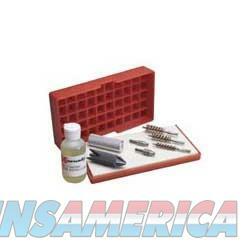 Description: Hornady 43300 Complete Case Care Kit Hornady's complete Case Care Kit gets you set up to prep cases for reloading and saves you money over purchasing the items separately. Includes environmentallysafe Hornady Case Sizing Lube, case prep tool handle, case mouth chamfering/ deburring tool, large/small primer pocket cleaner heads, and a case lube pad with built-in case holder/loading tray in the top of the lid that holds 50 rounds. Also includes three case neck cleaning brushes for .243/6mm, .338 through .35, and .44/.45 calibers. Prep the cases with the tools and brushes, apply lube to the pad, and roll the cases over the pad to lubricate them before running through the sizing die. Lube Pad/Loading Tray and Sizing Lube also available separately.